While it may technically be spring, Minnesota temperatures remain chilly (think single digits, brr!) It is this time of year, the transition from winter to spring, that lemon desserts are wonderful. Berries are not quite in season, and lemon is like a bite of sunshine, all bright and cheery. Add lemon to the ultimate chewy sugar cookie, and it’s Springtime perfection in cookie form…. Oreo Cookies and Cream Muffins are a tasty vanilla muffin studded with large chunks of chocolate sandwich cookies throughout. If you like Oreos (or Joe Joe’s!) and are looking for a fun recipe to try with them, these muffins are for you. While Oreo muffins are not something that I would make every day, after making the crust for my Lighter Chocolate Cheesecake Bars, I found myself with leftover Oreos (if there is such a thing). Why not try something new for a change! Oreo Cookies and Cream Muffins are glorious and definitely something worth trying if you’re a cookies and cream lover, like myself! Preheat oven to 400 degrees. In a standard muffin tin, line 12 muffin cups (or spray with cooking spray) and set aside. Make topping: In food processor, combine flour, sugar and crushed cookies until combined. Add cold butter, pulsing until crumbly. Put in a small bowl and set aside. Make muffin: In a food processor, put flour, sugar and baking powder and process until combined. Add cold butter, and pulse until mixture resembles coarse crumbs. Pour into large bowl. In a medium bowl, whisk milk, egg and vanilla. Add to dry ingredients, mixing until just combined. Gently fold in chopped cookies. Divide batter evenly among prepared muffin cups. Sprinkle with topping. Bake for 15 to 18 minutes, or until a toothpick inserted in the center comes out clean. Cool muffins in pan for 5 minutes and then move to a wire rack to cool completely. 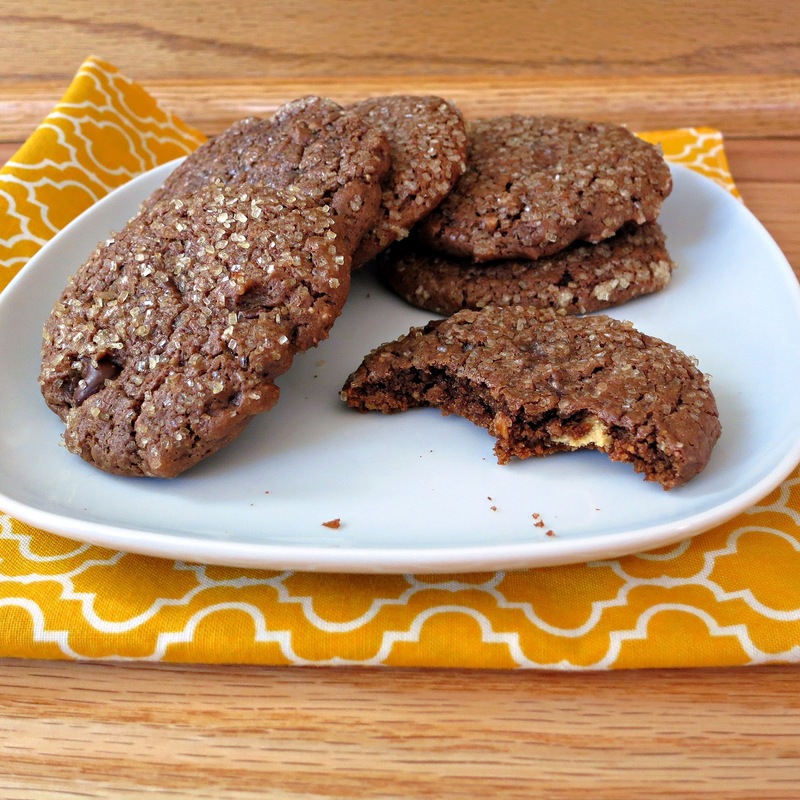 This is my favorite recipe for Chewy Ginger Cookies. They are soft, chewy, with warm flavors of ginger and molasses, plus they take 10 minutes to prepare! When it comes to holiday baking, I enjoy trying new recipes, but I also like to have some go-to recipes. Standby recipes that are guaranteed to be crowd pleasers and are easy to make. For years, I have been trying to find that special recipe for a ginger cookies. These Chewy Ginger Cookies are the top contender for becoming that special recipe. They are super soft and chewy with the warm flavors of ginger and molasses in each bite. The dough takes less than 10 minutes to make, which is always a bonus! This marks the final week of the 12 Weeks of Christmas Treats hosted by Meal Planning Mom. Be sure to check out the thumbnails at the bottom of this post for more delicious holiday treats! In a medium bowl, whisk together flour, baking soda, ginger, cinnamon and salt. Mix molasses and water in a liquid measuring cup, and stir until combined (Note: you may need to stir again before adding to butter mixture). In a large bowl, cream butter and sugar until combined. Beating on low, alternately add flour mixture and molasses mixture to the butter mixture, until fully combined. Refrigerate for at least 2 hours to overnight. Roll a rounded tablespoonful of dough into a ball and then roll the ball in granulated sugar. Place on prepared baking sheet. Bake for 12 to 14 minutes or until edges are set (be careful not to overbake). Remove to wire rack to cool completely. 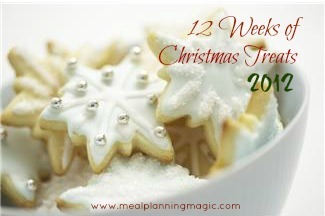 We are to Week #12 of the 12 Weeks of Christmas Treats hosted by Meal Planning Magic. Be sure to check out all the other bloggers who are participating this week in the 12 Weeks of Christmas Treats blog hop. Easy Chocolate Sandwich Cookies are a simplified version of a chewy homemade Oreo cookie. The chocolate cookies are soft, yet sturdy and the filling is a sweetened cream cheese frosting. The dough literally took me 5 minutes minutes to whip together. I feared the dough would be gooey and messy to work with, but it was quite firm and rolled into balls by hand without a huge sticky mess. I am sharing these delicious yet super easy cookies as part of Week 4 of the 12 Weeks of Christmas Treats, hosted by Meal Planning Magic. While this recipe makes plenty and these cookies are perfect for any holiday cookie platter, I made them pink in honor of Breast Cancer Awareness Week hosted by Erin of Dinners, Dishes and Desserts. To conclude Breast Cancer Awareness Week, tomorrow Erin is hosting a giveaway, so be sure to visit Dinners, Dishes and Desserts on Friday for a chance to win! Be sure to check out the thumbnails at the bottom of this post and visit the other bloggers who are posting amazing recipes today in support of Breast Cancer Awareness, and also for the 12 Weeks of Christmas Treats! In a large mixing bowl, beat cake mixes, eggs and oil until combined (Note: I used a hand mixer; batter will be very stiff). Roll dough into 1-inch balls and place on prepared baking sheet. Using the side of a silicone spatula, press to flatten the balls slightly. Bake for 8 to 10 minutes. Remove to a wire rack to cool completely before filling. (Note: I baked the cookies the night before and did the filling the next day). For the filling: In a medium mixing bowl, beat cream cheese, powdered sugar and vanilla extract until smooth. Add food coloring, if desired. Spread filling on bottom of half of the cookies. Top with remaining cookies. Finish decorating, as desired. Be sure to check out the bloggers who are supporting Breast Cancer Awareness Week for some delicious pink and/or healthy recipes! A couple tips: When flattening the cookies before baking, keep in mind they will spread. Just flatten them a little bit and you will be fine. Keep an eye on the bake time, because over baking the cookies will result in a less chewy cookie. I baked mine for 8 minutes and that was perfect with my oven…but definitely keep an eye on them. In a medium bowl, whisk flour, cocoa, oats, baking soda and salt. Set aside. In a large bowl, beat peanut butter, oil, brown sugar and granulated sugar on medium speed until blended. Beat in eggs, yogurt and vanilla until combined. Gradually add flour mixture to the peanut butter mixture, stirring until blended. Stir in chocolate and peanut butter chips. On prepared cookie sheets, place rounded tablespoonfuls of dough 2 inches apart. Dip the bottom of a class in water, and then dip the class in turbinado sugar. Using the sugared glass, flatten the dough slightly, leaving a thin layer of sugar on top. Re-wet glass, as needed. Bake cookies for 8 to 10 minutes (be sure not to over bake!). Cool on baking sheet for 5 minutes before transferring to a wire rack to cool completely.